Today @ 14 ladies from my quilt guild got together at a local firehouse to work on this quilt by www.farmhousequilt.com The title of the quilt became very appropriate for a couple of reasons today. One…the firemen were painting in the kitchen, which was located near our workspace and they had the windows open so it was COLD! We are still at the mercy of “Ole Man Winter”. Two…when we finished working on our projects and started home, it was snowing!! 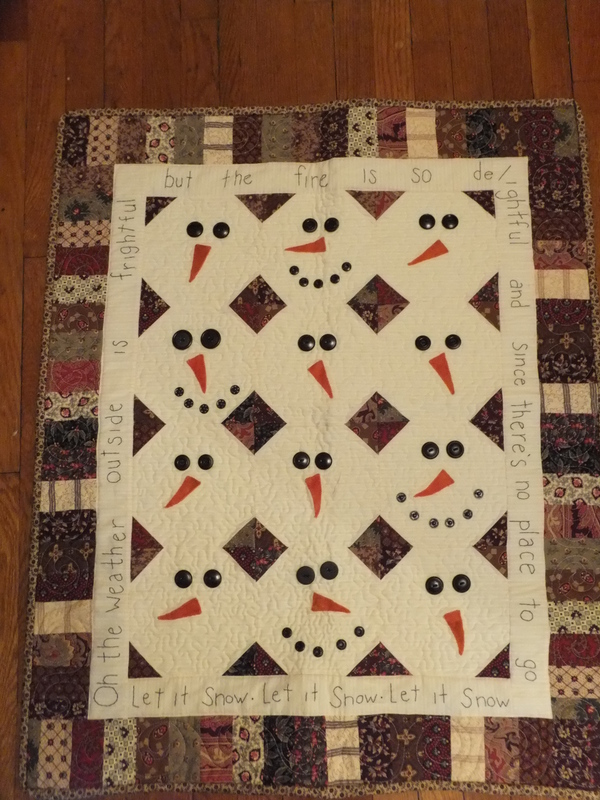 We took this adorable pattern and then we all decided to take the easy way out and forego making the 80 flying geese it took to complete the border. 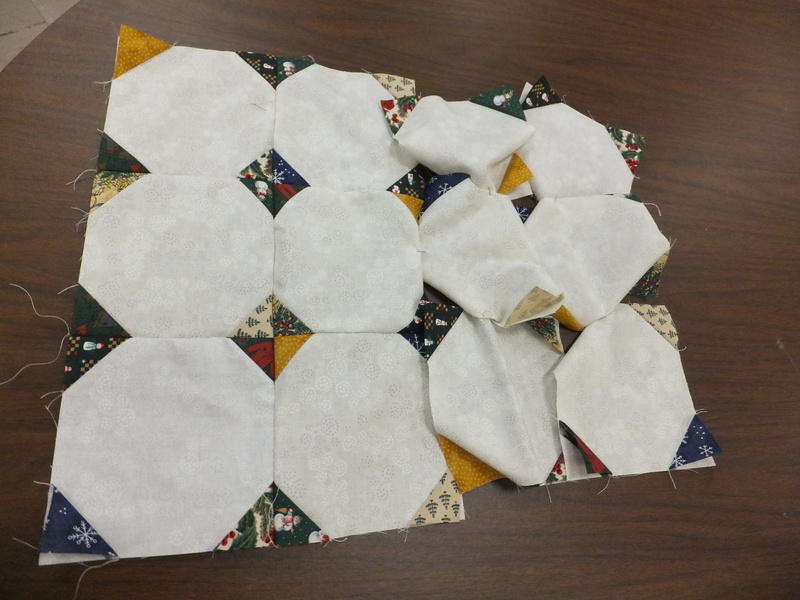 I guess I might be to blame for that, because I used scraps from another project for mine and I just had small squares and 2 inch strips to work with for my wallhanging. 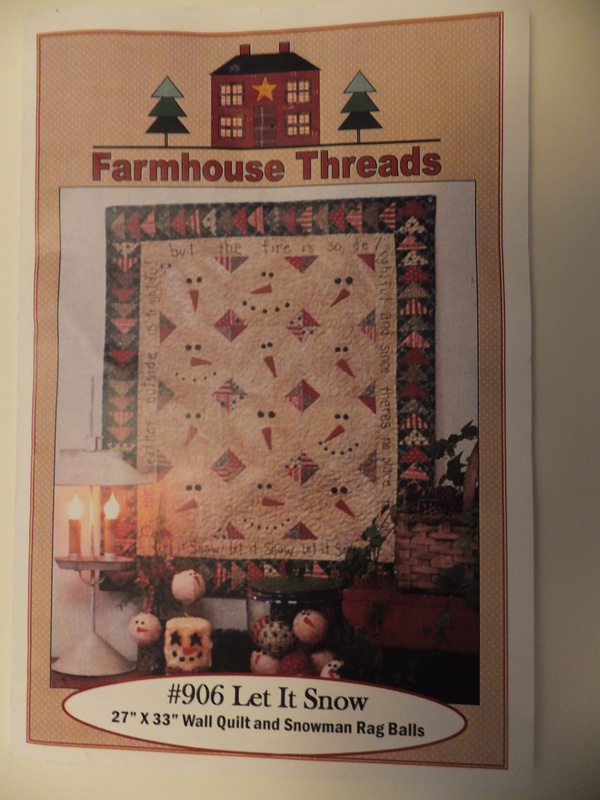 This is a picture of the pattern and as you can see it has many geese flying around the border. 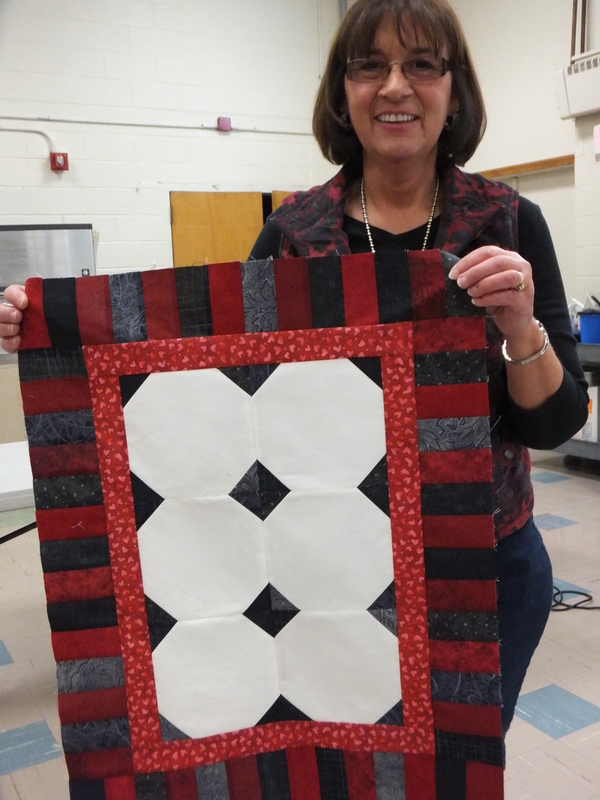 I made the quilt pictured at the top and took it for show n’ share at our quilt meeting a few months back. The ladies decided they would like to get together and make one for themselves. We set and date and now the rest is history. I did a little table runner using three of the snowball blocks to give them an idea of other colors they might want to choose for the wallhanging. A few of the ladies succumbed to the cold or had other things planned and didn’t get their’s completed. Here are a few of the pictures I snapped! You can see some of the detail on my finished quilt. I used big snaps for the mouth and buttons for the eyes. The noses are made of wool and blanket stitched by hand. 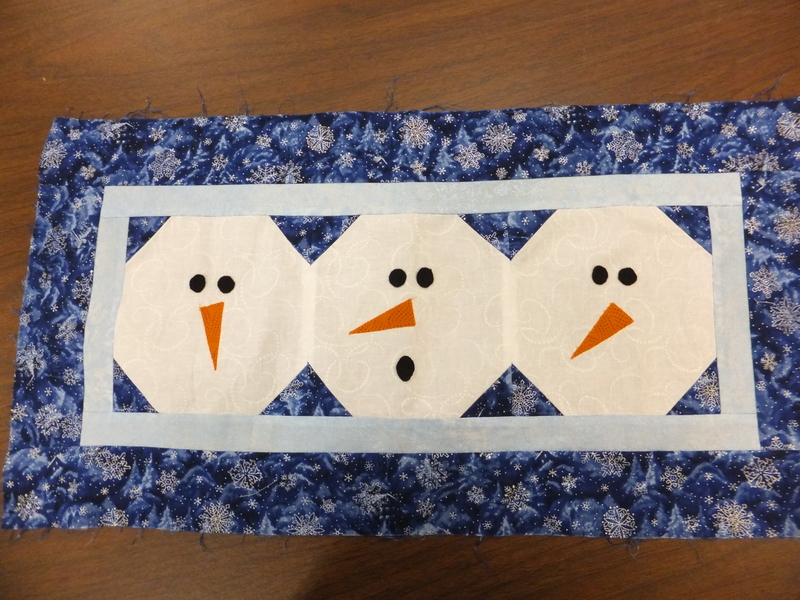 Anne had purchased some “fabric” Candy Bars which are cut at 2 1/2″ wide so she decided to use those for the corners on her snowmen blocks. She left early and I didn’t get a photo of the results, but I am thinking that it would just make the diamond between the snowmen a little larger. Kris had to leave for a potluck, but she did get her blocks finished. Mette thought it needed framed before she added the stitching. She will then add an additional border. I loved the way it looked like little bow tie blocks in the middle. We had two Anne’s attend the workshop. 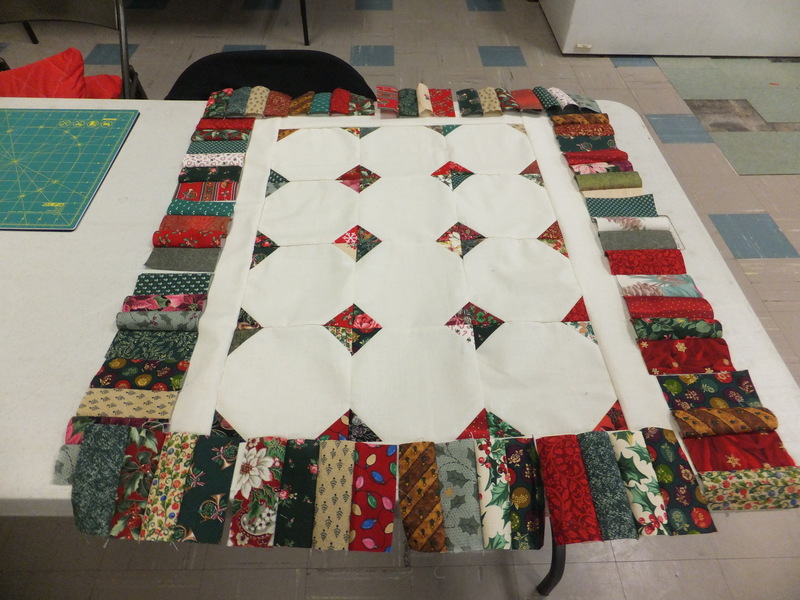 This Anne wanted to make a lap quilt, so she enlarged the snowball blocks to 9 1/2 inches from the original 6 1/2 inches. 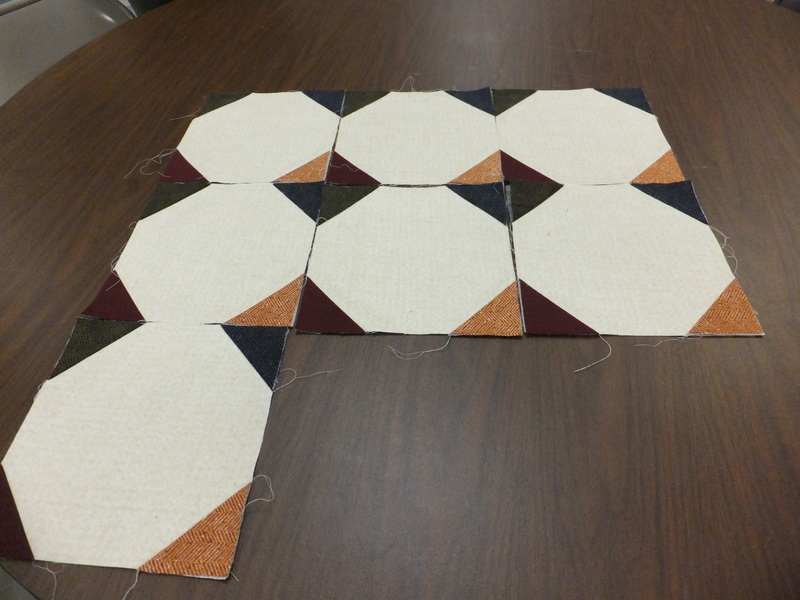 She made the blocks from flannel and she is going to add a larger border. Connie went smaller and the colors are red and black. 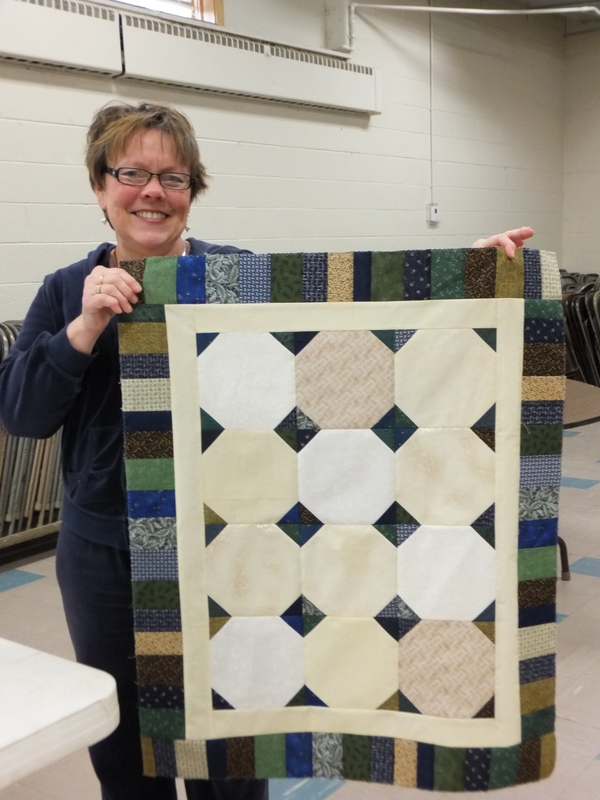 Helene got the center of her quilt completed. Her husband also showed up to help us with moving some of our equipment. Thanks Mike! 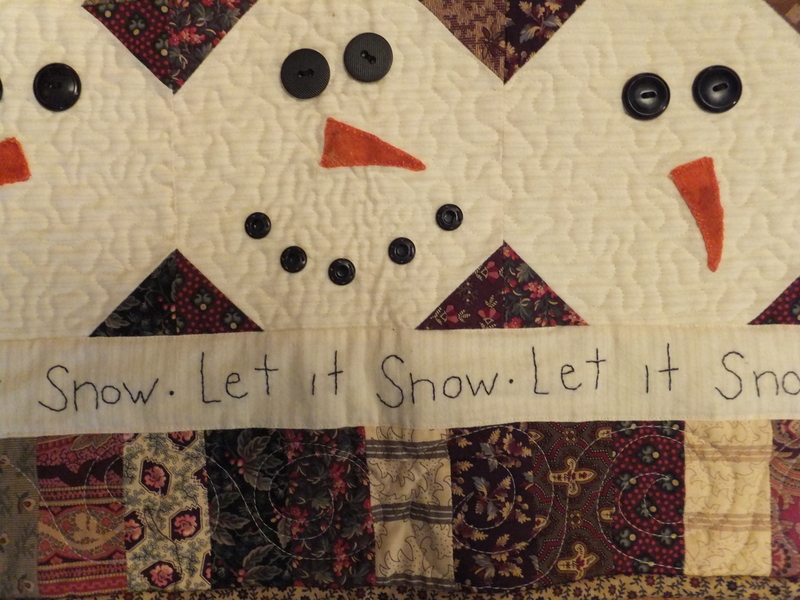 Pam used blues and greens in her quilt and an assortment of cream and white for the snowmen. 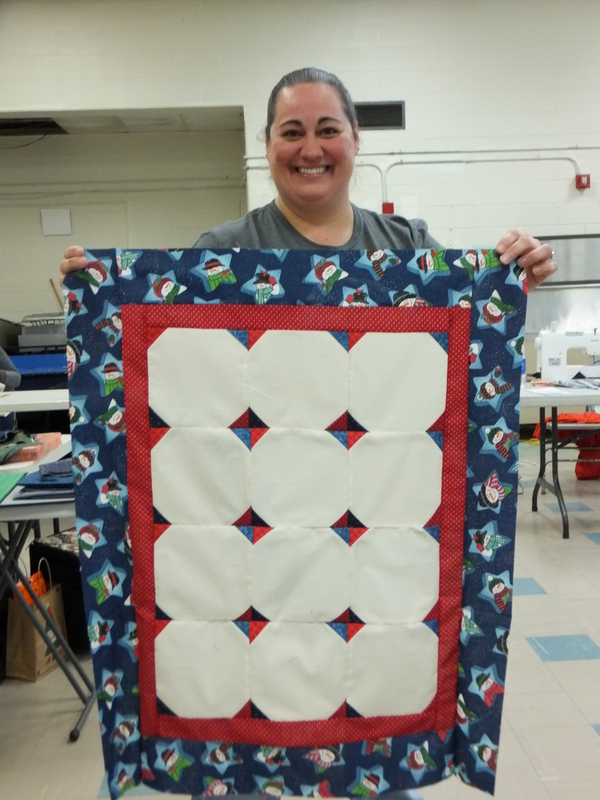 Jeanine used Christmas fabric for her quilt. 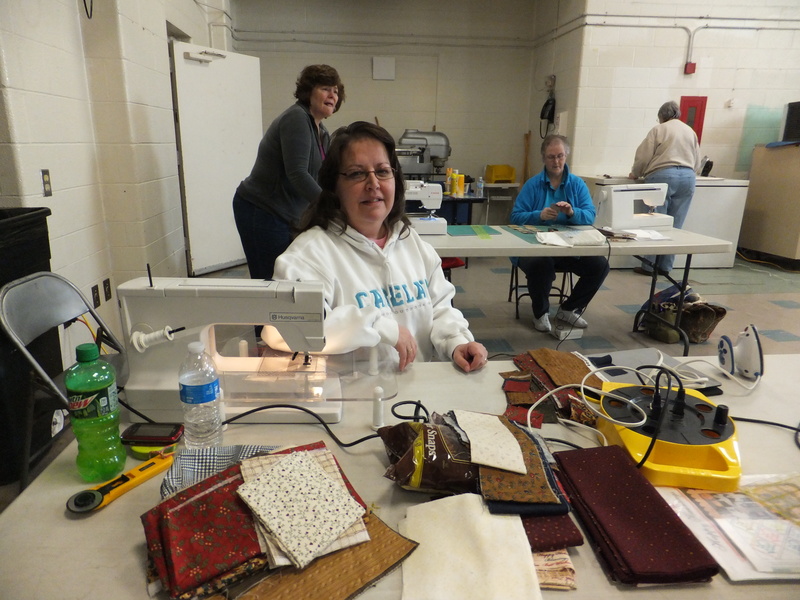 She was lucky enough to attend an estate sale where she purchased several “crates” of fabric. 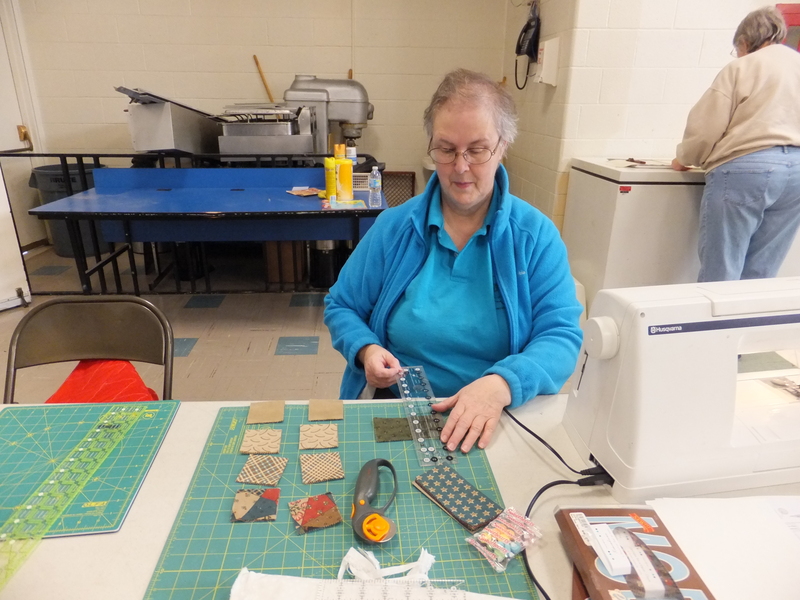 Included in the fabric were bags of pre-cut squares. 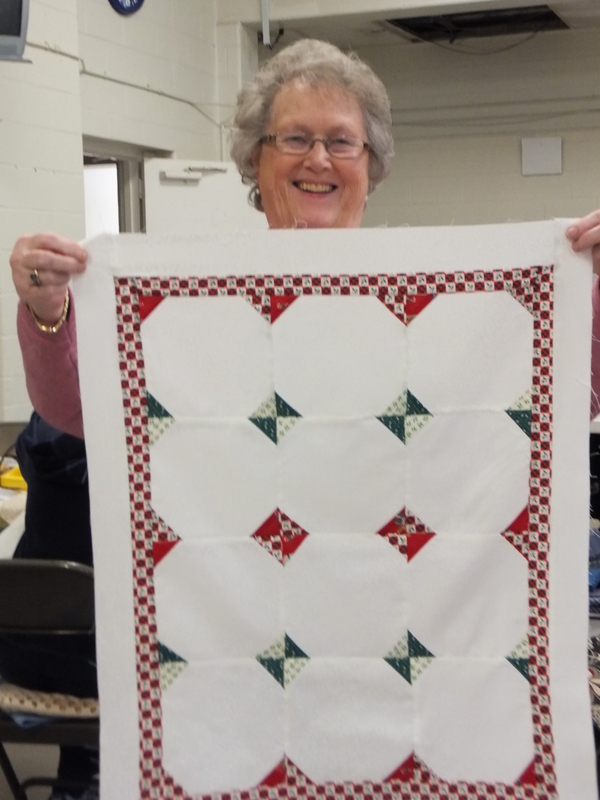 She used the 2 inch squares on the blocks and took the 4 inch squares and cut them in half and then used them to make the border. Then of course, there is one in every crowd, that thinks completely out of the box. That would be Sherry! 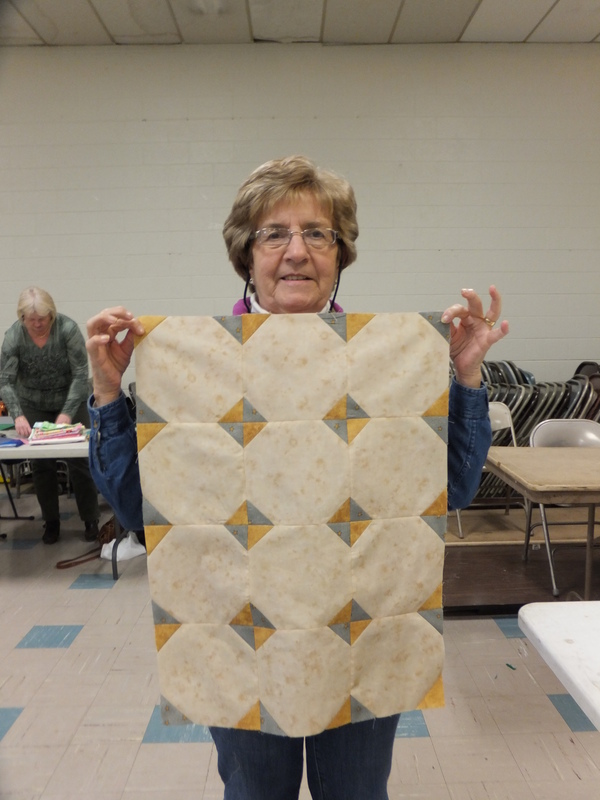 Not really, she was working on blocks for her Farmer’s Wife quilt and came along to join in the fun. I love her colors!! What do you think of her design wall…LOL! 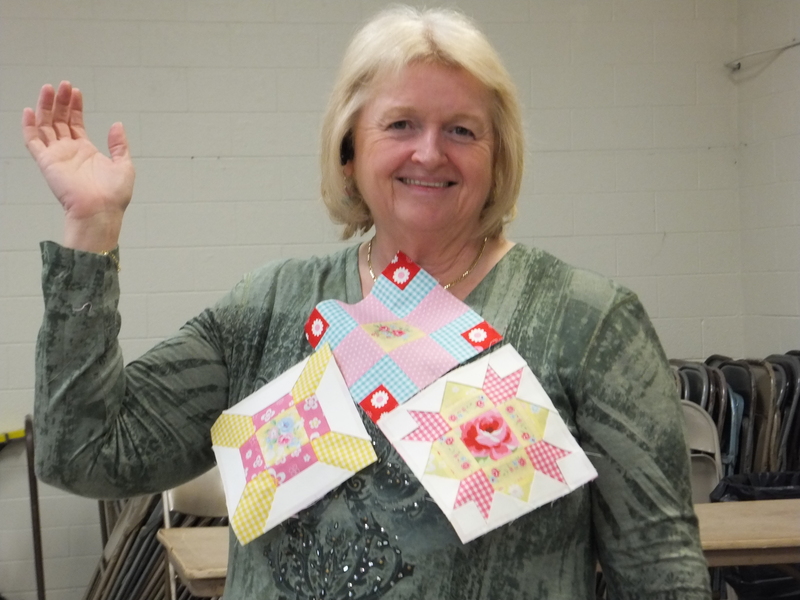 I hope this will give you some ideas on what you can do when you are making your quilts. Remember, make them your own. You don’t have to follow the pattern…just enjoy the journey. Enjoying a day with great friends is what life is all about.